Meal planning is tough for everyone. Even those without ADHD. If you are familiar with my website you have already noticed that I am big into budgeting, stocking a pantry, and planning ahead. I wasn’t always this obsessed. It actually started because I was fielding all kinds of questions whenever I told someone in my Facebook Group (or in real life) that I really only cook a few times per week. What? It’s true. I plan 2-3 dinners per week and we eat the same foods all the time for breakfast/lunches/snacks. 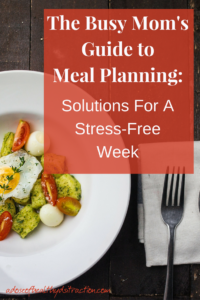 Meal planning is hard because you have to use so many skills at one time -skills which some of us struggle with. Things like thinking ahead, prioritizing, making choices, and actually getting started. It’s not like you have to have ADHD to struggle with meal planning, lots of moms struggle to get food on the table every night. This struggle to balance our schedules with our intentions is why so many of us end up relying on convenience and fast foods. I am one of the most executive function challenged people on earth and I am here to tell you successful meal planning is possible. Meal planning takes commitment, persistence and practice but it is so worth it in the end. Here I will outline what I consider to be the three most important aspects of successful meal planning. I have only 3 categories because I don’t want to confuse the issue by inserting too much information. First, you must have a budget. Eating out several nights per week. Buying more food than we can eat in a reasonable amount of time. Purchasing foods we hope** our family will eat and then throwing it away. Allowing our children to dictate what we will be able to serve. There are multiple other extraneous expenses that come into play when it comes to feeding a family, but these are some of the big ones. Despite the coupons and specials available when we dine out, you absolutely will spend more money going out than if you eat at home. At a minimum, limit your dining out to once per week. Also, when it comes to finding more money in our budget for buying whole foods, we need to prioritize. For more information on living the good life on a budget check out this post. In the interest of keeping this post a manageable size I will direct you to my post on stocking the pantry. Next, if you have never attempted to meal plan before, start with your family. Check your freezer and fridge. You might find that you have the essentials to make a few meals already on hand. If not, at least you can take an inventory of what you do have that will inform your list making. Check out your local grocers online. Most retailers and big box stores put weekly specials or a flyer out each week. You might notice that organic chicken is a great deal this week. If that were the case you could write down chicken first. As you go through the specials continue writing down things that might be of interest to you. This is the start of your list! For recipes I love Pinterest. I usually take my list of specials and do a search for meals that have those ingredients. I am a fan of searching for crockpot recipes because they are easy to prep and adjust to your tastes. Take your time. Create a board with recipes that appeal to you and have no more than 10 ingredients. Look at the skill level involved and try to filter out recipes that are too complicated. When you have narrowed the field to a few solid recipes for the week compare the ingredients to what you already have on your list from the store specials. Add any ingredients that you do not already have in your pantry. Complete your list by adding your regular breakfast, lunch, produce and snack foods. You are now ready to shop! Keep your list on paper or in an app of your choice. Avoid impulse buys. If it is not on the list you probably do not need it. Stay on the perimeter of the store. Packaged foods in the center look like a good deal, but more often than not are filled with crap. If you become overwhelmed ask an employee to help you find what you need. Take advantage of store membership and rewards programs. Check your receipts. Cashiers do occasionally make a mistake or a barcode doesn’t work. I have an entire post and an example of my own food prep that you can check out here. I like to precook as much of my proteins as I possibly can. If you prefer, you can certainly do it on the spot. If you know your week will be super busy, go ahead and precook so all you have to do is reheat. Make sure you take the time to chop any veggies or ingredients you might need so that you are not standing at the counter with a knife on a Wednesday evening. It feels so good to just open a plastic bag of veggies and dump it on a tray to roast. Cook any grains and/or prep oatmeal if you eat that for breakfast. Portion out salad greens for lunch. Boil a dozen eggs for snacks. Do whatever you can to make your life easier during the week. You do not have to have a particular system in place. Just prep anything that you know you will not have the time and energy to make after running around all day. Finally, I know meal planning is not easy. Successful meal planning takes some patience and dedication. But if you can work on it and refine a system that works for you, you will save thousands of dollars and hours of time each year. If you need more detail about Meal Planning check out my Ebook. It’s inexpensive but still offers some actionable advice.